I was born in Chesterfield and have lived here pretty much all my life. I am a senior lecturer in pre-registration nursing working at the St Helena site. My career has been long and varied and I have worked in many different locations but in terms of location, I have not really flown far from the nest. I was at school in the 1970’s at St Helena, I trained as a nurse at the old Chesterfield Royal Hospital (now the Kennings building next door to the St Helena site) I then trained as a midwife at the old Scarsdale Hospital at the bottom of Newbold Road. I qualified as a nurse in 1983 and had a variety of staff nurses posts including care of the elderly, neuro-surgery and intensive care. In 1985, I trained as a midwife and practiced midwifery for almost 20 years working both on the delivery suite and in the community. Part of my role as a midwife was a secondment working with teenage parents. This role had a lot of teaching in it both to young people and to professionals and this is where I gained my passion for teaching. I joined the university off Derby in 2007 teaching BTEC health and social care and assessing NVQ’s in health and social care. 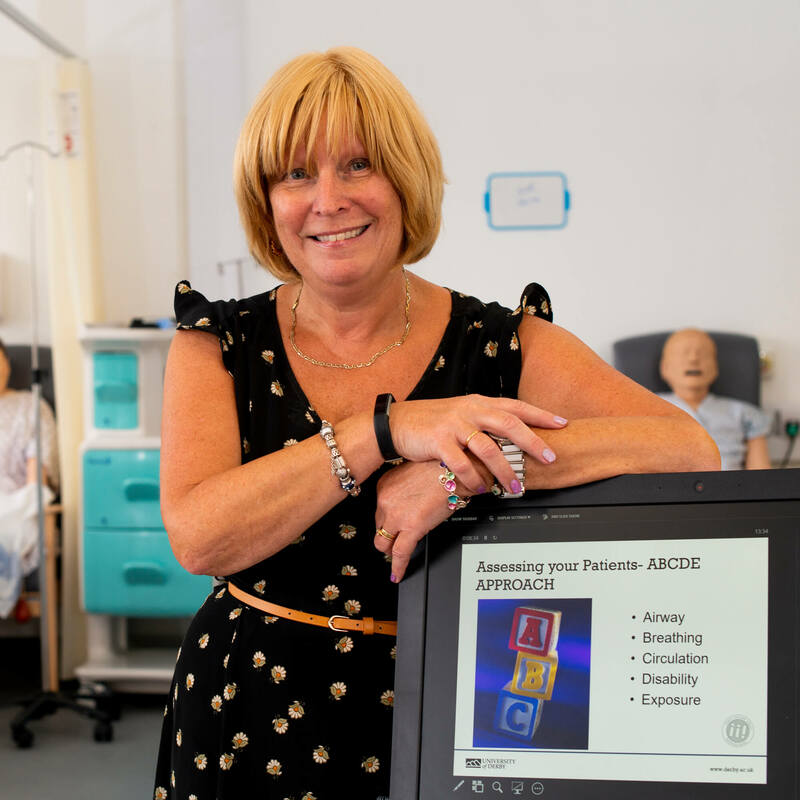 While I loved working in FE, my passion has always been to teach adult nurse and midwives so in 2014 I applied and was honoured to be offered the post of lecturer in adult nursing. This has been the most exciting and interesting part of my career so far. My main teaching responsibilities are teaching in stage 3 of the adult nursing programme. I am stage 3 lead and work on all the third year modules. I am responsible for preparing student nurses for qualifying. I teach advanced clinical skills and embed team working, leadership and managment into this. My role includes embedding theory into practice. I work extensively within a simulated environment, using the simulation to facilitate learning basic clinical skills up to high fidelity complex patients and ward scenarios. This method of teaching is a powerful way of building students confidence and helping them to deverlop skills like clinical descision making and differentail diagnosis. The students love this type of teaching. My professional interests are wide. I have a keen interest in all aspects of nursing. I am dual qualified so continue to have an interest in midwifery, I lead a maternal mental health workshop for stage 2 adult nursing students. I hold a diploma in contraception and sexual health, I completed BASHH training and until September 2016, I continued to work clinically in sexual health clinics. I was contracted for 6 hours per week but had to resign due to increased pressures from my full time lecturer’s role at the University of Derby. I continue to be very interested in Sexual and Reproductive Health supporting several students with independent study focussed on sexual health for example cervical screening, HIV, chlamydia and HPV. I have worked in critical care and continue to be interested in critical care nursing particularly sepsis and working with acutely ill patients. I am part of the special interest in clinical simulation group at the university and work to develop simulated practice for students. Diploma in the Practice of Family Planning and Sexual Health. I am a keen football fan, I support my local club Chesterfield. I also love other sports including cricket. I love being outdoors walking my little dog and enjoy socialising with family and friends.